No, you are not turning on the horizontal scrollbar! 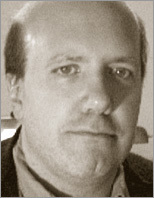 Chris Adamson is a writer, editor, and independent developer specializing in media software development for iOS. He is the co-author of iOS SDK Development and Learning Core Audio. He maintains a corporate identity as Subsequently & Furthermore, Inc. and writes the [Time code ]; blog on media software development, as well as tweeting as @invalidname. He is based in Grand Rapids, Michigan, and thus far has owned 13 ½ Macs. "Over all I found the book a really enjoyable read. I definitely recommend it to anyone that wants to learn iOS through a hands on experience. This book will give you a great foundation to start building on." "...if you do program in Java and you are interested in developing QuickTime applications, then QuickTime for Java(TM): A Developer's Notebook by Chris Adamson (O'Reilly, 2005) should be on your bookshelf. Better yet, it should be propped open on your desk as you work your way though it."